Whether you agree or disagree with his policies, one thing is certain: making someone’s Tweets look like they were written by a third-grader is really funny. The folks at the Daily Show proved this with their Chrome/Firefox plugin MakeTrumpTweetsEightAgain. The extension is pretty simple: any Trump Tweet is automatically turned from a measured, well-crafted response to a pressing geopolitical issue into the scribblings of Walker, your 8-year-old nephew who is really into The Force Awakens. It works on Chrome and Firefox only – Safari users are SOL – and you can turn it off in case you need a dose of seriousness in your political discourse. This isn’t the first political Chrome extension and I doubt it will be the last. Obama had his share and and there’s even a whole-hog filter that removes the entire political spectrum from your browsing experience. Technology, it seems, is as good at filtering our experience as it is dumping a firehose of data down our gullets. 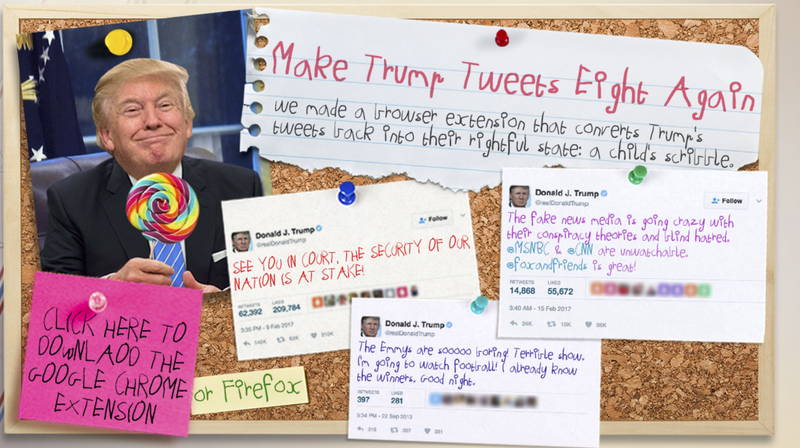 In the end Chrome extensions won’t sway popular opinion in either direction – I’m sure there are some readers who are itching to tell me off for suggesting that our president has the mind of someone who watches Just Add Magic un-ironically. My advice? Write a Chrome extension that turns off Twitter completely. We’ll all feel a lot better.